Remember when I first reported the story about the shocking 'Fatherly Advice' rapper Too Short gave to young boys about young girls? Remember I said it would be really nice if some of the men would jump on this cause and take the rapper to task? Well, it looks like we've found a man willing to grab the proverbially baton and run with it. 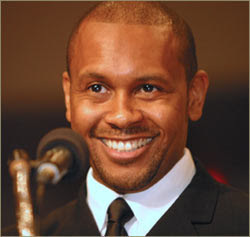 That man is activist Kevin Powell; who, after a past history of violence towards women, has made it his life's mission to bring attention to and stop this sick pathology that has taken root in our society. Kevin sat down for an interview with HLN's Richelle Carey to discuss the offensive remarks made by Too Short. He invokes the name of the late, great C. Delores Tucker and how all the things she spoke about in the 90's are proving to be true. He also called for the firing of XXL's editor-in-chirf, Vanessa Satten. I am glad to see that there is male support for this issue. If we are truly going to deal with the problem it has to begin with people accepting a matter of reality about this type of attitude. Not only is violence against girls/females being advocating but it is also just another adult male giving advice that will only land some other male in jail. Too Short is too old to use the excuses that he did in his apology. His apology was very weak. Even in "Too Short mode," it is an irresponsible thing to say. I am glad that Mr. Powell spoke out against this.